Some dresses have no competition, never ever they can be defeated or no other attire can ever replace them. They have such a spellbound grace that charm created by them never seems to become go down. They are astoundingly amazing in leaving the indelible impression. Designer Lehengas. Which has become the most demanded attire is exclusive in highlighting the latent glow of females. In the present era trust is the biggest thing and Moksha Fashion believes in providing thrustworthy attires to its cutomers. 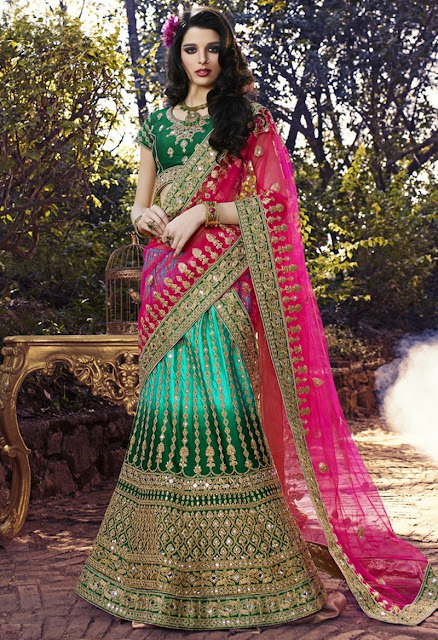 You can pick up any Designer lehenga without even cheking the quality of the fabric from Moksha Fashion. It assures you in providing as max comfort as it can. If we talk of the work then threading workdone in goldmakes your Designer lehenga more impressive and can make you the attraction of the occasion.